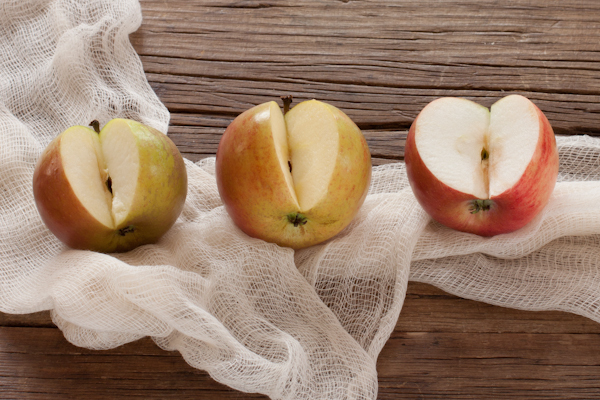 While you might only see three or four types of apples in the grocery store, did you know that there are hundreds of heirloom apple varieties, each with its own unique taste and story? The three I tasted were like nothing I regularly get in the grocery store, they have so much more depth of flavor and character. I like to imagine that my favorite English or early American historic figure might have munched on these. All these are organic, available in both baby and regular sizes. The Cortland apples are now available at Sprouts in California, Nevada, and Utah; and all varieties are available at Central Markets in Texas. You can ask the produce manager in your local grocery stores for Organic Heirloom Apples from Frieda’s Produce if you don’t see them already in store. Ribston Pippin: (Green with orange streaky blush.) This apple was grown in 1708 from one of three ‘pips’ (seeds) sent from Normandy to Sir Henry Goodricke of Ribston Hall, Yorkshire, England. 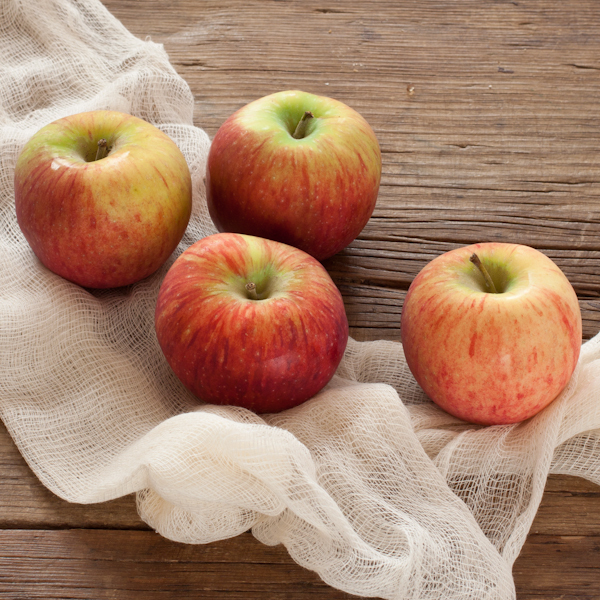 It has one of the highest Vitamin C concentrations found in apples. Its yellow flesh is firm and sweet, with a pear taste. I found it to have a softer texture, slightly tart. Cox’s Orange Pippin: (Mostly green with a touch of orange.) 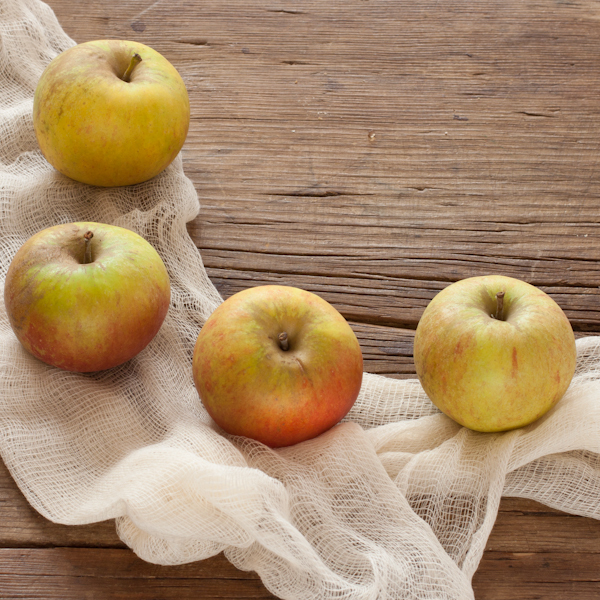 This heirloom apple still dominates the English markets. Got its name from creator Richard Cox, a retired brewery worker in the early 1800’s. The skin takes on an orange tinge at ripening. Has a juicy, nutty taste and firm flesh. This variety is good for all around use; both in cooking, juicing and eating fresh. My favorite! Crunchy, juicy, sweeter, crisper texture, and distinct orange-tinged flesh. Cortland: (Vivid red with a touch of green.) 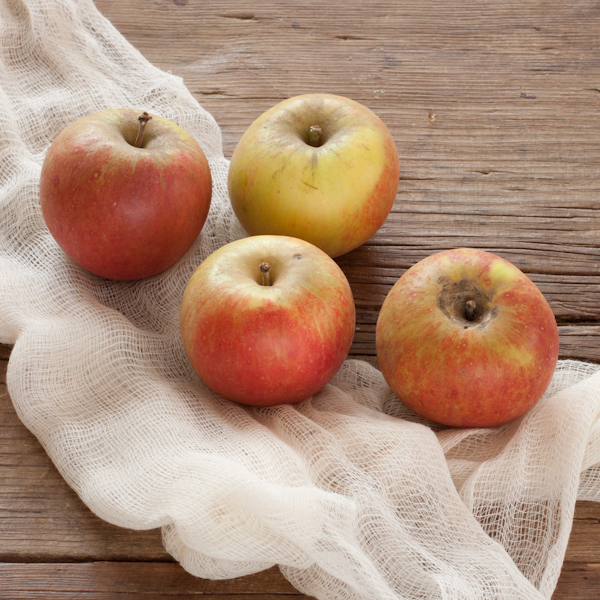 The Cortland heirloom apple was developed in 1898 by Professor S.A. Beach of New York. It is another high quality red apple, which often will have dark red streaks on the outside. Inside you will find a crisp, white flesh and a somewhat tart, sweet flavor. Very juicy. A good salad apple because it does not brown for hours after slicing. The Husband’s fave. Pearly white flesh, slightly tart at the skin, softer texture, not too sweet. Would be great in a Dutch baby or pancakes, thinly sliced. Required FTC disclosure: The apples were sent to me by Frieda’s Produce. I was not paid to write this post. Today’s post is part of our mission to help you rebuild your health through food and lifestyle choices. 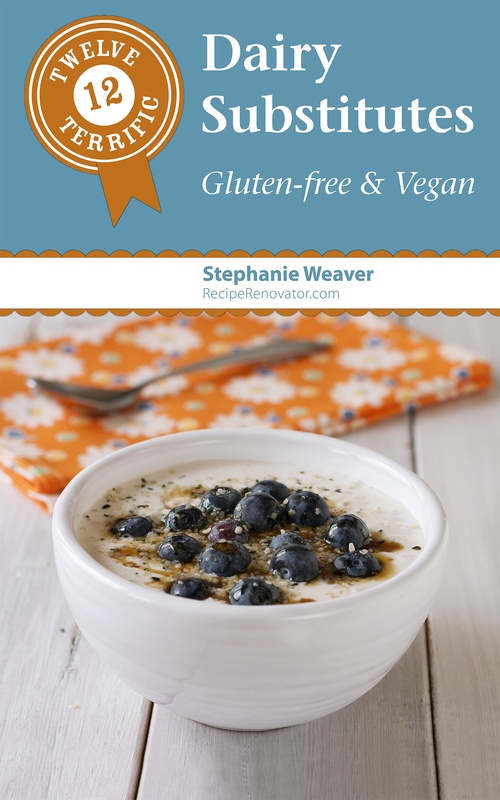 Look for posts on Mondays featuring gluten-free, sugar-free recipes made with healthy plant-based ingredients, Tuesday reviews, Wednesday essays, Thursday how-to’s, and Flashback Fridays recipe posts plus monthly giveaways on the last Friday of the month. We support Meatless Monday. Check out our new Meatless Monday blog hop, and monthly Google Hangouts featuring Meatless Monday bloggers and authors. Heirloom apples are so fun! It really opens your eyes to the fact that an apple is not just an apple. I agree Dorothy. I love eating an apple and thinking about who in history might have eaten the same variety, like Ben Franklin or someone from England. My favorite heirloom is Northern Spy. I haven’t heard of that one Karen, will have to see if I can find it!